One is a happy-go-lucky, foul-mouthed prankster with a penchant for killing himself and a wrinkly avocado love child for a face. The other is, well, Wolverine. While they are both near invincible, can heal from virtually any wound, and enjoy dressing up in primary colors, the similarities mostly end there. Which means anytime you get James “Logan” Howlett and Wade Wilson (aka Deadpool) in the same room, someone is definitely going to get stabbed in the face. Like Abbott and Costello, Laurel and Hardy, Turner and Hooch, and Jay-Z and Kanye, these two were made for one another. They might not always see eye to eye, and more often than not, they want to rip each other's heads off, but damn it if they sure aren't entertaining to watch. Which is precisely why life does not get any better than seeing these two come together to brawl, chit chat, and occasionally dress up like women. Here are Wolverine and Deadpool's Best Team-Ups (and Fights). Let's start at the beginning. Amazingly, the Crimson Comedian had been kicking around comics for three whole years before he had his first run-in with Captain Canada. When they finally do meet, things don't go so well for Wolverine. Or his lungs. In 1994's Wolverine #88, Deadpool is trying to get his ex-girlfriend back, so he trashes her new beau's apartment like a mature superpowered adult. Wolverine just so happens to arrive on the scene, and the two immediately start insulting one another (because when you meet the right person, you just know). Impressively, Deadpool's taunts send Logan off his game, and he proceeds to make quick work of the X-Man by impaling him through the chest with two swords. To be fair, all the adamantium attached to Wolverine's bones had recently been ripped from his body, sending his healing factor out of whack. The combination of this weakened state and Wade Wilson knowing exactly how to get under Wolvie's skin (literally) is all it takes to take out the hairy mutant. Mean spirited and brutal, this brawl was a great way to kick off the beginning of a beautiful friendship. A few years after they first met -- and Pool put two katana-sized holes right through Wolverine -- the still adamantiumless Crazed Canuck evened the score. To provide some context, Wade Wilson has just recently killed a messianic space baby and is feeling down about the whole thing, not to mention hallucinating cockeyed bunny rabbits. So during 1999's Deadpool #27, he seeks out psychiatric counsel from Doctor Bong (of Howard the Duck fame), and together, they decide that the only way to break free from the rut is to fight a superhero. Guess which one? The fisticuff therapy session that ensues begins with Deadpool uppercutting Kitty Pryde with a Shoryuken to the face and finishes with Wolverine skewering the Merc with a Mouth right in front of the bunnies - poetic payback for their first meeting. Apparently, Wolverine is exactly what the doctor ordered, as the violent, slapstick, action-packed altercation helps Deadpool work through his issues and feel a whole lot better. Because who needs pills when you can have two bone claws to the gut? Never one to let bygones be bygones, Wolverine is still pretty peeved over Deadpool having uppercutted Kitty Pryde. So a few years later, when he spots the Crimson Comedian hopping some rooftops in Wolverine Annual '99, Logan takes the opportunity to bash his head in with a pipe. But after spending the better part of the '90s trying to stab one another to death, we finally get to see the ole Weapon X alums team up when amidst this beatdown, a werewolf shows up and tries to eat them both. You see, Deadpool is on a job to assassinate a werewolf-turned-acclaimed-author who has forsaken his werewolf heritage and is now being hunted by one of his werewolf brethren. This for some odd reason resonates with Wolverine, so he decides to put down the pipe and spend the rest of the story fighting valiantly to save the were-author with Deadpool in tow. Eventually, a Council of Werewolves materialize straight out of Underworld and threaten the author to never show his face in polite society again before everyone disappears and Wolverine and Deadpool are left to wonder what the hell just happened. All and all, it's a pretty ridiculous story. Fortunately for us all, no matter how many times Wade and Logan kiss and makeup, there will always be a reason for them to beat the crap out of each other. In Wolverine #154, that reason is money. Deadpool is hired to take out Wolvie for a wad of dough at the behest of some maniac who wants to save the world by dissecting mutants. Or something. None of that really matters. What's important here is that we finally learn the correct dosage of sedative needed to knock out Wolverine. After sharing a few punches and roundhouse kicks to the face interspersed with their usual wordy banter, Logan quickly gets the upper hand, but makes the classic good guy mistake of giving Deadpool a second chance to rethink his life decisions. Pool's answer? A gun clip full of drugged darts to Logan's hairy chest. Spoiler alert: he lives. Overall, this isn't so much a fight as it is Deadpool shooting Wolverine with enough tranquilizers to take down a T-Rex. Which basically means that Logan has the bodily constitution of a dinosaur, as if there weren't enough reasons to love this guy already. While the duration of fighting is short between the Wade and Logan in 2009's Hulk vs Wolverine animated movie, what's there is well worth the price of streaming. The Weapon X program is at it again, only this time, they're trying to reprogram Hulk into a weapon of massive green destruction. Obviously, this goes horribly for them. But it does give us the opportunity to see the Green Goliath throw down against Wolverine and everyone's favorite Regeneratin' Degenerate. Granted, the idea of an adamantium-laced Hulk is awesome. But we wouldn't want to be around when someone tries to make it happen. Because whether you're a superhero or supervillain, we're all just waiting to be smashed by the big guy. So despite Deadpool shooting Wolverine in the head and Wolverine slicing off Deadpool's arm like a slab of salami, they eventually both end up running for their lives when the Hulk gets angry and starts demolishing everything in sight. Logan takes this opportunity to do what any of us would do when fleeing for their lives: pick up Deadpool and hurl him at the Incredible Hulk. As expected, this does absolutely nothing. The big green rage monster merely swats the Crimson Comedian away like a puny fly, presumably breaking every bone in his body. Point Wolverine. Most of the time when Wolverine and Deadpool get together, it's for a quick stab to the chest, insult to the face, and bombing of North Korea (more on that in a moment). Just as quickly, though, they'd go their separate ways, leaving us anxiously awaiting their next bloody reunion. 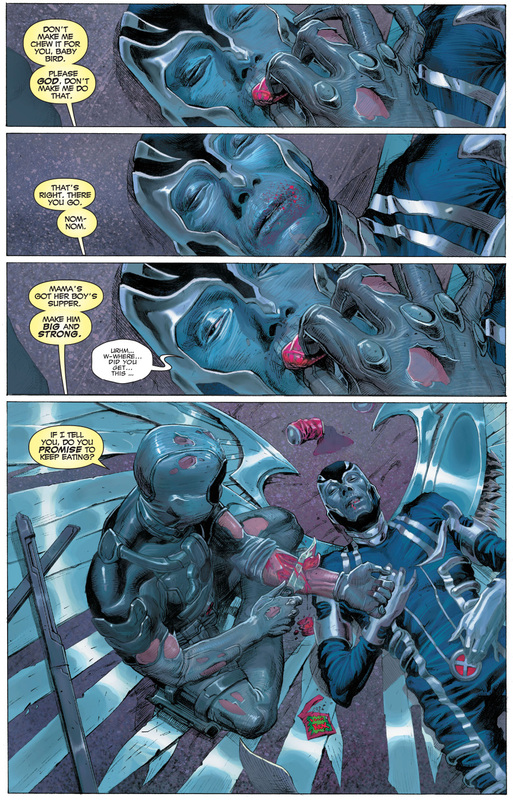 But then came along 2010's Uncanny X-Force, and for the first time, they officially became teammates killing for the greater good. X-Force was originally started as a black ops team to eradicate any threats to mutant kind with extreme prejudice. At one point, it was disbanded by the powers that be for being too extreme. Always eager to give the finger to authority, Wolverine formed a new X-Force in secret and called upon fellow mutinous mutants to join. Of course, Deadpool was at that top that list. Though in this iteration, he isn't as zany as his usual self, and he actually shows signs of righteous moralism, like when he fed an emaciated Archangel pieces of his own flesh. Overall, the two didn't have too many noteworthy moments together comparable to their other meetings (other than coordinating their outfits), but just knowing that there was a time where Deadpool and Wolverine were on the same super secret assassin squad makes the world feel like a better place. And the winner for the most violent fight between Deadpool and Wolverine goes to their five-issue battle royale in Wolverine: Origins #21-25. We open with Logan sitting down to a nice Chinese dinner in San Fran, when all of a sudden, a nearby duck stuffed with a bomb blows him up. Enter Deadpool, who has been hired by a mysterious figure to kill Wolverine once and for all. What ensues is an unrelenting blow for blow blood bath that plays out like a best of Looney Tunes cartoon. Imagine Deadpool as Wile E. Coyote and Wolverine as the Roadrunner (if the Roadrunner had retractable claws, enjoyed smoking big cigars, and killed people). In his hunt, the Merc with a Mouth pulls out all the tricks, setting one elaborate trap after another. From dropping a piano on Wolverine to having a trip wire yank him across a highway into oncoming traffic, it's all here. Not to mention a litany of explosions caused by well-placed hand grenades, exploding ninja stars, and Wolverine slamming head first into a fuel-filled mac truck. This last one causes a brief break in the action while Deadpool changes clothes and takes a moment to check himself out in the mirror. But don't worry, that's not all folks…. As one is wont to do after getting thrown into oncoming traffic and slammed into a mac truck, Wolverine loses his cool. Going into a full-on berserker rage, he slices Deadpool's fingers off. Unable to use a gun, the Regeneratin' Degenerate pulls out a rocket launcher instead, setting the whole area ablaze. Logan deftly dodges the attack, quickly gets the upper claw, and is poised to slice Pool's head off when a nearby woman screams that her car is on fire with her baby locked inside. Always the do-gooder at heart, this snaps Wolverine back to reality and he jumps in to save the day, only to find Deadpool has set the whole thing up and the baby is actually a doll stuffed with -- you guessed it -- a bomb. But apparently, getting blown up by a duck, a truck, and a baby was Wolverine's plan all along. You see, the 2006 series Wolverine: Origins features Logan out on a quest for vengeance against anyone who's ever looked at him the wrong way. This includes his estranged son, Daken, who wants nothing more than to have his father dead. So Wolverine anonymously hired Deadpool to try and kill him in order to lure Daken out of hiding, because Logan knew the kid couldn't stand to let someone else do the deed. For Deadpool's part, he gave it his best shot. After unleashing his final explosive toddler tour de force on Wolverine, the duo embark on a back and forth body stab fest that ends with Deadpool shooting Weapon X in the head. Wolverine survives, some more stuff happens, he gets his revenge on his son, and Deadpool has both his hands chopped off. Thank goodness for healing factors. Where would we be if we couldn't see these two dismember, blow up, and savagely desecrate one another for the rest of time? Deadpool has been brainwashed into killing the entire Marvel Universe. One by one, they all fall. He wipes out the Fantastic Four, roasts Howard the Duck, blows up the Avengers, decapitates the Hulk, fries the X-Men, shoots Spidey in the face, tortures Professor X, skins Beast alive, and even meta-kills Marvel's writing team. Amidst all that carnage stands his perennial spiky-haired adversary as Marvelkinds last hope. Unfortunately for Wolverine and the rest of his comic bubs in this elseworld tale, Deadpool is packing a sword made out of carbonadium. This durable metal was created by the Russians as a synthetic form of adamantium. While not as strong as the real thing, it does have the noteworthy effect of wreaking havoc with Wolverine's healing factor, as in it severely stunts it. One slice to the abdomen and an axing to the head later, and Deadpool drops one of our favorite superheroes dead. In other words, blame the Russians. Someone keeps stealing Deadpool's organs with an ice cream scooper. Calling upon his women's intuition to figure out why, he ends up taking a trip down memory lane to uncover the sordid past of the Weapons Plus super soldier program. So who he gonna call to help? The two men that know the program better than anyone else of course -- Wolverine and Captain freaking America. But when he interrupts Logan in bed with Storm and gets in the way of Captain America saving America, both immediately tell him to get lost. Wolvie and Deadpool get separated following their takedown of the assault team mentioned above, and the Regeneratin' Degenerate soon finds himself in a North Korean internment camp as the prisoner of his old Weapons Plus caretakers. It turns out that they have been using Pool's organs to create a Korean clone army of deadly mutant super soldiers funded by Kim Jung Un and Co. Deadpool manages to make a run for it and finds out he's not the only captive -- both Wolverine and Captain America have been taken as well. Wade sets them loose, and the trio prepares to fight their way to freedom. Meet the Good, the Bad, and the Ugly, the greatest superhero team ever. Joined by several rebellious mutant clones, over the issues of Deadpool #17 and #18, our heroes take on the entirety of the Korean People's Army, several of whom have taken a swig of mutating serum and turned into gigantic rock monsters. As terrifying as that might seem, even more terrifying is the powerful melee of adamantium fists, patriotic shields, and witty one-liners coming at their faces from the joint attacks of Wolverine, Captain America, and Deadpool. Suffice to say, the threat is quickly incinerated. Deadpool has to dress up like a woman to help Logan fight a killer robot from outer space who is out to kill Jean Grey despite the fact that she's already dead. Out of context, this might sound crazy. In context, it makes even less sense. Welcome to the one-off issue of 2011's Wolverine/Deadpool: The Decoy. The first thing you immediately notice about this comic is that Deadpool spends the majority of it naked. Our first glimpse comes when Wolverine interrupts him in the shower to ask for help destroying the aforementioned space robot. Deadpool agrees and kisses Logan to seal the deal (still naked). Later, after several failed attempts to take the threat out, Wolverine calls upon his last resort, making that kiss all the more awkward. To fill the void of seeing the Merc with a Mouth couple up with a super serious, gritty, uber-masculine mutant when Wolverine is nowhere to be found, there's the delightful 2004 cult buddy cop series Cable and Deadpool. (Which is a big reason why we're going to get not just one but two movies with them in the future.) Sadly, by issue #44 of the series, Cable has apparently died, leaving an even greater need for Wolverine in Deadpool's life. Leave it to Pakistan to bring these frenemies together. Deadpool is on a mission to retrieve his friend, Weasel, from a Hydra base in Pakistan. Coincidentally, Wolverine is on a mission to take out the base's new Sector Commander, whose been developing super-cool teleportation suits. When it is revealed that Weasel is actually the Commander, Deadpool decides to stand in the way of Logan killing him. So Wolverine cuts Deadpool's head off instead. Hydra Agent Bob (it's a long story) scrambles to put Pool's head back on as it gets kicked around in the ensuing brawl between Wolvie and the Hydra fleet. Bob eventually succeeds, and Deadpool springs into action doing what he does best -- stabbing Wolverine through the chest. Soon after, Weasel admits that he is a double traitor who's tricked Hydra into wearing the suits so he could teleport them all to oblivion. Deadpool holds Wolverine off long enough for this to happen, and everyone walks away a winner. All and all it's a touching episode of friendship lost and regained...and watching Deadpool's head bounce around like a soccer ball. In case you're keeping score, Wolverine and Deadpool are pretty much tied when it comes to mortally wounding one another. Which means there's only one battlefield left to settle the score -- Twitter. A huge advantage of having Hugh Jackman and Ryan Reynolds play these lovably murderous superheroes is that we get to see them seize the spirit of their characters and routinely jab one another in the name of good fun and thinly veiled marketing. When Reynolds got a star on the Hollywood Walk of Fame, Jackman encouraged fans to urinate on it. When Hugh visited China, Ryan took the opportunity to troll him and his fan base. Later, Deadpool impersonated Jackman campaigning for Sexiest Man Alive by making fun of his accent. Who needs guns and claws when tweets will do just as nicely? Once upon a time, there was a movie called X-Men Origins: Wolverine, and it was horrible. On so, so many levels. (Gambit anyone?) However, the film's greatest sin of all was taking one of Marvel's most enjoyably stylized characters, beloved for his incessant motor mouthing and 4th wall breaking verbal hijinks, and sewing his damn mouth shut. No wonder this film nearly drove Hugh Jackman to quit playing Logan for good. This version of Deadpool could have been great. On paper, having a movie end with the Crimson Comedian and Wolverine fight atop a cooling tower while Liev Schreiber dances around them sounds amazing. But whoever that Merc without a Mouth up there was shooting lasers out of his eyes, it certainly wasn't Deadpool. Nope, that was something named Weapon XI that drove two sword-hands right through three decades of glorious skewerings, insults, and cross-dressing shenanigans shared by Wolverine and Deadpool. We could point out all the other ways Marvel royally screwed the Pool with this film, not to mention ruined one of the best pairings in comics, but let's instead just be thankful for all the good times we've had watching these two desperately try to kill each other. Did we miss any other classic Deadpool on Wolverine action? Let us know in the comments.